It’s been a busy couple of weeks, and after missing baking last weekend, I was really looking forward to getting back in the kitchen today. Last week, Ben and I went to the (hopefully) final wedding of the year. Three within about three month is quite a lot, considering Ben was best man in two of them! It was a wonderful weekend in Dorset, where we stayed in a B&B in a village called Shitterton (I kid you not). I think one of the best parts of the wedding day was the wedding cake. The couple, whose last name is Cheesman, decided to go with a stack of different kinds of British cheeses as their tiered wedding cake. It was such a great idea! They had real wedding cake as well, but it wasn’t the focal point. Needless to say, I tried quite a few types – including one wrapped in nettles! This week was Independence Day in the US, but while my friends and family back home were celebrating by lounging poolside and having massive cookouts, I was busy running my first-ever 5K along with some of the other ladies from the office after a long day at work. 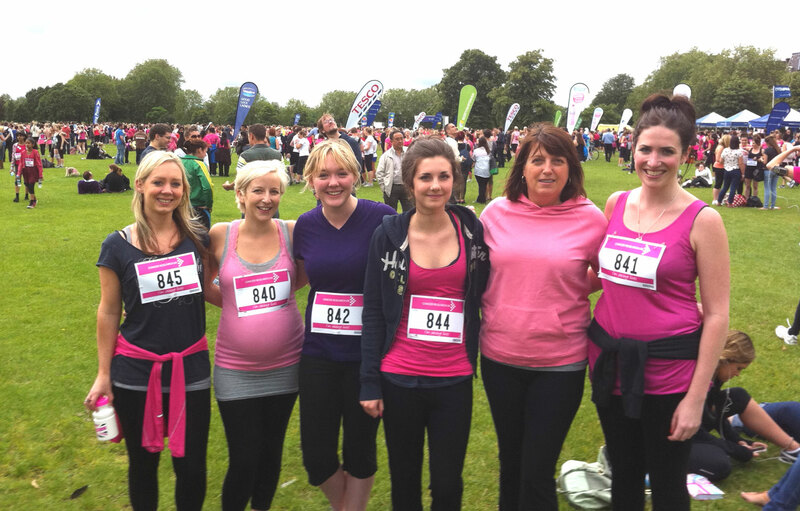 It was for a great cause though, and gave me a bit of a boost in wanting to get back in shape! And while there were no beers, hot dogs, or fireworks, it was a great day! Originally I wanted to bake something to celebrate Americana in honor of the 4th, but then I do that just about every time I bake. So instead, I decided to celebrate my personal achievement by making something with my all-time favorite flavor combination: peanut butter and chocolate. I figured I’d then squeeze in the Americana bit by making it in brownie form. So off I went to find a recipe, but surprisingly not that many recipes came up! I found plenty of cheesecake brownies, and other flavor brownies, but the only one I came across for peanut butter and chocolate used a box-mix for the brownie batter. And while I have no problems with a good Betty Crocker box mix, I’m determined to make everything for my blog by scratch. It was time to experiment. This recipe comes from combining two other recipes and making a few adjustments. 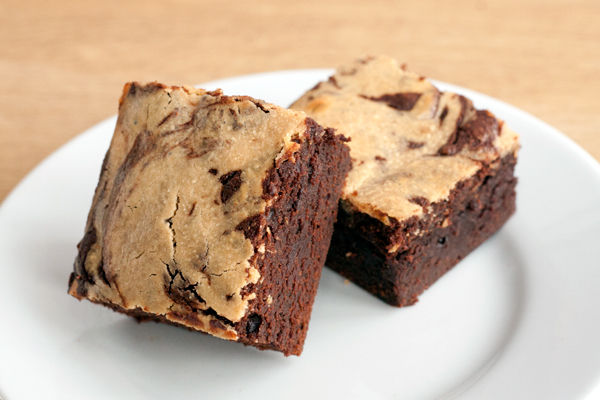 What came out was a rich, decadent brownie that just begs to be eaten with a tall glass of cold milk. My only caveat was that I wish I had swirled in the cheesecake batter a bit deeper, as the brownie batter rose quite a lot – but otherwise I’m happy. 1. Preheat oven to 350° F (approx 175°C). Butter two glass 8×6-inch baking dishes, line with baking paper and grease the baking paper as well. 2. First make the brownie mixture. In a heat-proof bowl over simmering water, place the chopped chocolate and butter and gently mix until everything melts and the mixture is smooth. 3. In a large bowl, whisk together the melted chocolate, eggs, and sugar until combined. Then add in the flour, cocoa powder, baking powder, and salt. Whisk until smooth then distribute the batter evenly between your two prepared dishes. 4. Next make the cheesecake mixture. Beat together the cream cheese, eggs, and both types of sugar using an electric mixture. Add in the peanut butter, then add in the milk as needed to make the mixture smooth, but still thick. Finally, add in the vanilla and salt and stir to combine. 5. 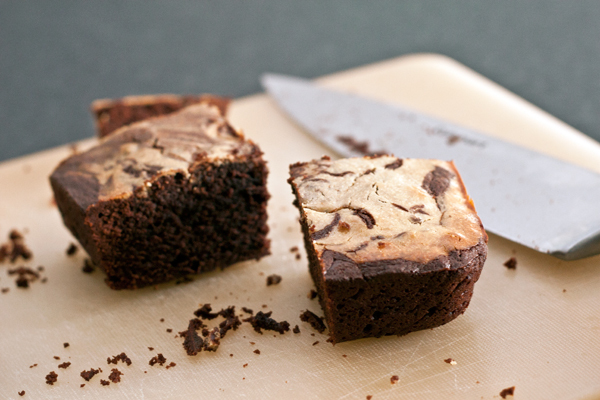 Drop spoonfuls of the cheesecake mixture over the brownie batter,and use a butter knife to swirl it into the batter. 6. Bake the brownies for approximately 40 minutes, until the center is set. Remove from the oven and allow to cool in the pan for 15 minutes. Remove from the pan by lifting the baking paper and transfer to a wire rack to cool completely before slicing.